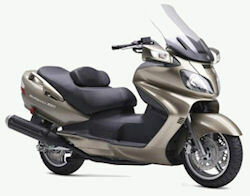 Suzuki is well known for its powerful "best of class" maxi-scoot, the Suzuki Burgman, and indeed, those are most of the reviews that people have already posted here. It seems people love their Burgmans! Suzuki scooters include both a 400cc Burgman and a 650cc model. Either way, these are highway-ready bikes that can take you long distances in comfort, even with a passenger. If you have the money and can handle a large scooter that is nearly a motorcycle, then the Suzuki scooters series might be right for you. If you're looking to read some other people's reviews of Suzuki motor scooters, then click here to skip down to them. Or, if you just want to submit your own Suzuki review, use this handy form. Can you speak firsthand about a Suzuki scooter? If so, that's great... I want you to share it with our site visitors & community! Tell us all the ins and outs of what you do and don't like about your Suzuki scooter. The more detail you include, the more meaningful this review will be for future visitors to this page. A review that just says something like "Awesome scooter! Love it!" has no real value because it doesn't tell us what you liked... or didn't like. Sharing your scooter review is easy to do. Just start typing. But please DO include lots of detail, or I won't publish the review, because it won't have any real value. 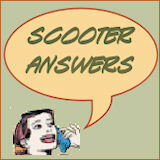 The more you can tell us about the scooter, the better! 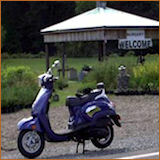 Your scooter review will appear on a Web page exactly the way you enter it here. You can wrap a word in angle brackets to make it appear bold. For example my story would show as my story on the Web page containing your story. Do you have pictures of this Suzuki scooter that will make this review more meaningful and interesting? Great! Click the button and find the first one on your computer. Then select it. 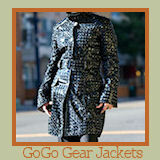 You can include up to 4 pictures here, so once you select the first one, click the link to add more. 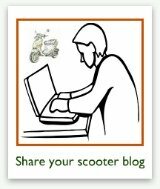 If you'd like to see some of the other scooter reviews on this site, return to our main motor scooter reviews page. 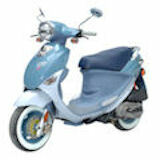 Suzuki has a solid history in 2-wheel vehicle production, having produced popular motorcycles for many years. 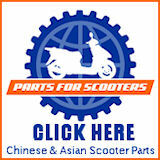 But they also offer a high quality line of motor scooters too, which you can see by reading our Suzuki scooters reviews on this page.